We could not utilize the chance to go out of town this weekend due to Sachin’s busy work schedule. So we decided to spend a few hours birding within the city itself. On Saturday morning, we made our way to the reserve mini-forest in J.P.Nagar. We got to know about it through one of the mailing lists we are subscribed to. It was suprising to find forest land within the city. Apparently, the forest is abode to many species of birds. Unfortunately, we did not manage to see too many of them. We got to see the male/female Purple Rumped Sunbird, Female Loten’s Sunbird, Pale-billed Flowerpecker, Greater Coucal, Oriental Magpie Robin, Black-head Cuckoo Shrike, the Green Bee-Eater and the Chestnut Headed Bee-Eater. 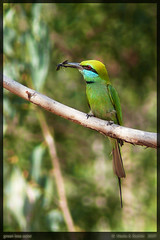 At one time, we could see atleast 10-12 bee-eaters at the same time, sometimes with prey in their beaks. These are amazingly skillful hunters. They swoop down on their prey in-flight (almost out of nowhere) which include wasps, bees, dragonflies etc. It indeed is a very captivating sight. Going down Bannerghatta Road, take the first right after Shopper’s Stop. (This takes you to Mysore Road). About half a km down this road, you hit Delmia Circle (the first major traffic signal). There is a K.C.Das store on the left. Take this left. Go down the road which is muddy in patches, past the “Green Skies Blue Forest” Apartments. This leads you to the entrance of the reserve forest. On Sunday evening, we went to Madiwala lake. Our expectations were not very high since we had heard and read about the deterioration of the lake many times. The lake was filled with Water Hyacinth weeds, some areas were stinking and some areas had a lot of filth lying around. But still, we did manage to see a lot of birds in the two hours that we spent there. From a great distance, we got our first sighting of the Pied Kingfisher. We had been looking for this one for quite some time. This amazing bird is known to hover in mid air, before plunging down into the water to grab its prey. We also saw a bunch of Herons(Pond, Night, Purple, Grey), Egrets, some Storks(the distance was too much even with binoculars), the Purple Moorehens and a few others we could not see clearly enough to identify. 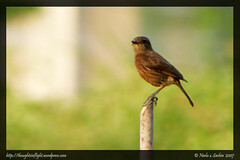 We got a good chance to photograph the smaller birds near the park area. Spent some time with the Ashy Prinia, the Paddyfield Pipits, the male and female Pied Bushchats and a couple of other birds we are yet to identify. Of course, as expected it was crowded in the evening (along with the sights of lovers making out). Next time we will go there early morning before the crowd gets in to catch more species of birds there. Coming down Hosur Road from Koramangala, take the right at Silk Board, leading into BTM Layout. Take the left at 31st Main. This is after the Kuvemu Nagar BMTC Bus Stand, and leads you right to the park/lake. …more thoughts in flight. coming soon. 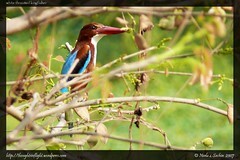 A sight of this jewel had actually attracted us to bird-watching a few months back. A commonly sighted bird near a water-body, its blue color looks spectacular in flight. Commonly mistaken as a parrot. We’ve seen this umpteen times but for the first time we got so close. 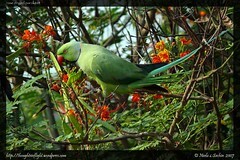 It was busy picking its food and did not notice us, giving us enough time to click good close-up pictures. Almost a guaranteed sighting at Hebbal Lake. Not as shy as other birds of its size, it is very easily identified by the shape of its beak, nice bright purple and yellow colors and acrobatic poses. …always a pleasure to see these cute creatures. 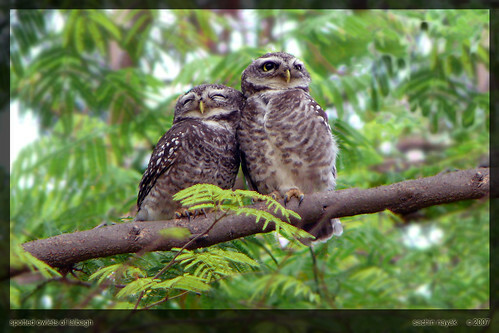 But the ones at Hebbal Lake don’t seem as friendly as our favorite couple at Lalbagh. 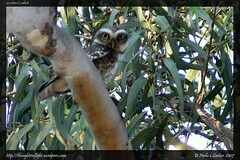 Can you see its angry eyes in the pic? 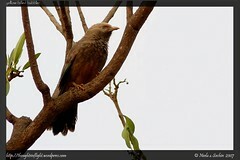 Not as striking as its male counterpart (rather common feature in the bird world), it is olive brown above and yellow bellow. Though we’ve never heard its “Did-he-do-it” call, we had our own interpretation until we lately realized how different it actually is. 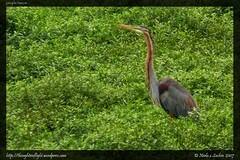 Peacefully spends all its time on the ground near a water body. Saw this inside one of the water holes the last time we went there. It spent a long time there “wagging its tail”. This week we did not see it and we missed it. Yeh banda cute sai hai, chalta rahte hai apni duniya mein. 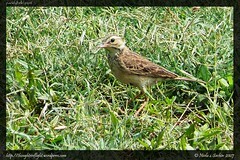 Brown colored slender bird, was walking for a long time in the garden on the right just after you enter the park gate. 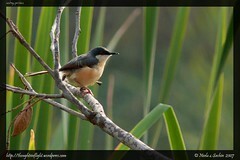 Also called the White-headed Babbler. We saw a bunch of them today and one of them entertained us with its pleasant musical call for quite some time. 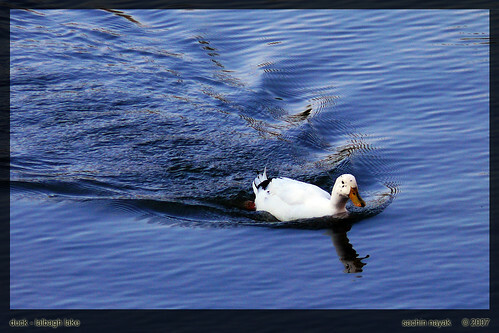 A very graceful water bird, you can see its purple colors inflight. We’ve not had clear pics of this one yet. You also get to see the Grey Heron at Hebbal which is primarily whitish with a black collar band and clear markings along its neck. We must have clicked at least 50 pictures of this bird today. 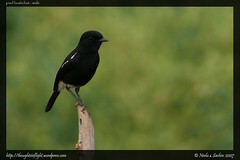 It is smaller than a sparrow, ashy coloured above and white below. 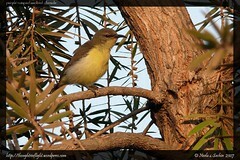 Has an interesting long tail (typically erect) and a very pleasant call. 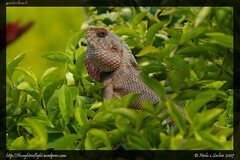 The first sighting of the lizard almost gave us a shock. Never seen such a huge lizard before. Interesting colors. 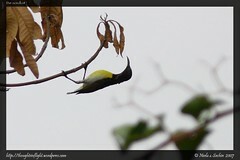 Another pic of the Purple Rumped Sunbird, doing what it is best at – Acrobatic Performances. 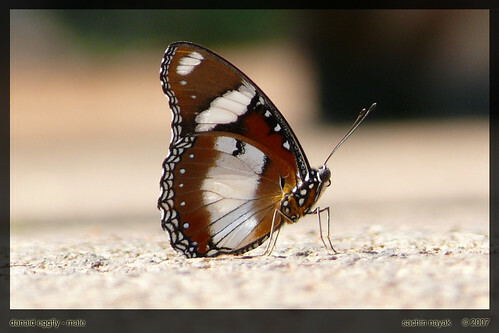 On April 1st, we made a trip to Nandi Hills which is a haven for the birds (and birdwatchers). In the two years since we have moved to Bangalore, we never went to Nandi hills. And now in two months it was our second trip there. The essence of this place is to be there very early and leave before the crowds get in. 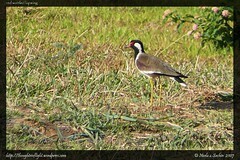 Last month when we went there, we saw many birds but had no clue about their identities. We could identify just a few… like the paradise flycatcher, the blue capped rock thrush and the oriental white-eye. This time we decided to do some homework before embarking on the trip. 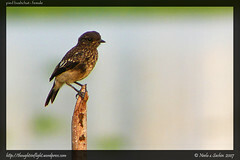 We looked up the birds found on Nandi Hills from various mailing groups, blogs and INW. We went through the pictures, noted down their characteristics; determined to identify some of the many small birds we had seen there before. We also hoped to sight some raptors which are regularly seen in the hills. Soon after we bought the tickets from the ticket counter, we could see a raptor down in the valley. However it was at a great distance and sitting in away in which we could just see its back. So unfortunately, even though our first sighting was of a raptor, we could not identify it. We made our way to the children’s playground where we had seen a lot of birds last time. 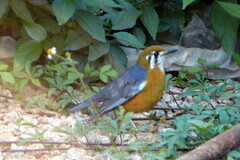 As soon as we got there, we saw the red-whiskered bulbul and the blue rock thrush. The rock thrush seemed to be friendly and gave Sachin a lot of photographing opportunities. We also saw the Tickells leaf wabbler, the orange thrush, the blue rock thrush female, the plain flowerpeckers, the pied bushcat and the paradise flycatcher. Of course a lot of identifications were made after verifications at home looking at Salim Ali’s bird guide. Our homework also helped us quite a bit. We got a glimpse of the Egyptian vulture in flight. After spending a good three hours in the area, we had breakfast and then went to the tank area. We had seen a good variety of birds here last time around and thus were very hopeful. The start was not very great as we could hardly spot anything. But then we luckily got to meet a couple of experienced birders (Rajesh & Rajneesh) who showed us the India Pitta. It was inside the densely wooded area, definitely impossible for us to sight it by ourselves. 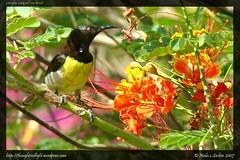 A multicolored beauty, it was a very friendly bird who let us spend around 15-20 minutes clicking its pictures. 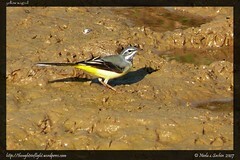 Apparently, seeing this strikingly beautiful bird within a month and half of birding is really an achievement. We saw a few more birds like the Tickells blue flycatcher there and finally made our way home. 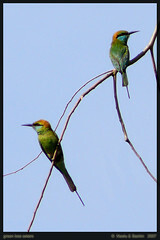 On the way back, we saw a few green bee-eaters along the road. It was amazing to see them catching bees in mid air, suddenly out of nowhere. We kept a watch on the trees lining up the road down the slopes hoping for any raptor sighting, but unfortunately there was none. Finally reached Bangalore at 2:30 pm. It was a tiring but a very fruitful trip this time. Hope the next trip is even more productive as our knowledge about sighting these beautiful creatures increases. Getting There – “Nandi Hills” is around 60 KM from Bangalore (towards the north). Take the Bangalore-Hyderabad highway (NH-7) from the Hebbal Flyover. Around 30 kms down this road, you reach Devanahalli. You come across a prominent signage of the upcoming International Airport (BIAL) on the right. Another 5 kms straight ahead, you come across a left turn that takes you to Nandi Hills. This turn is “unmarked” (or possibly marked in Kannada alone). Lookout for a smallish board displaying “Canterbury Castles”. This is where you need to get off the highway. P.S. – Do not mistake it for NH 207 (to Doddaballapur) which is the previous left turn (It leads you to some L&T factory). Post the left turn, 20 Kms of driving gets you to the foothills from where directions to Nandi Hills are very clearly marked. The road condition is good overall with a few patchy spots nearing the hills. While the highway (NH-7) is very good, beware of some “unmarked” speed breakers that pop out of nowhere, especially if you are driving in the dark. We got “shaken up” a couple of times on our first drive.